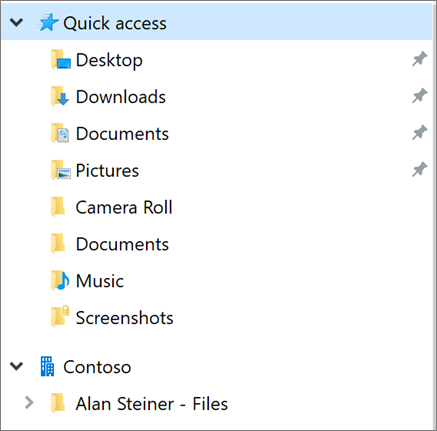 If your Office 365 admin gave you access to another person's OneDrive, you can work with files in it as you'd work with files on a SharePoint team site. Copy files to your own OneDrive, or to a SharePoint team site. Open the person's OneDrive in your browser using the link you were given, select the files you want to copy, and click Copy to. For more info about selecting a file destination, see Copy files and folders between OneDrive for Business and SharePoint sites. Download files to your computer. Open the OneDrive in your browser using the link you were given, select the files you want to copy, and click Download. Tip: Save the OneDrive location as a favorite if you think you might need to access it again. If you need to copy lots of items or work in multiple folders, we recommend syncing the OneDrive using the new OneDrive sync client. You can then move files and folders between locations by dragging them in File Explorer or Finder. If you sync your own OneDrive, or any SharePoint team sites, you can easily move items from the other person's OneDrive to these other locations. To get started, open the person's OneDrive in your browser using the link you were given and click Sync. The OneDrive will sync like a SharePoint team site, so it will appear in File Explorer under the name of your organization. For more info about setting up sync, see Sync SharePoint files with the new OneDrive sync client.